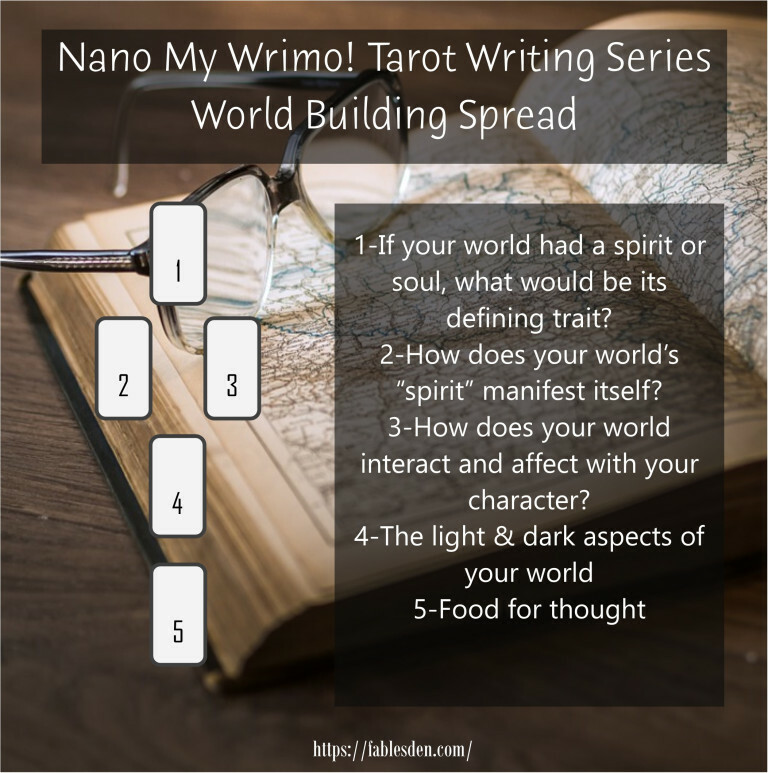 In this post, you will find a useful tarot spread that will help you figure out the “spirit” or “essence” of your story world and how it interacts with your character. If you don’t intend to use tarot for writing whatsoever, you can simply use these questions and the content of this blog as journal prompts, sources of inspiration, or just food for thought. This post will also offer you focus questions and a sample reading to give you some ideas + help you unpack the symbolic messages of the cards. The focus questions are general questions that you can use to apply to any card position in a reading, so feel free to mix and match! Also, as long as you have access to some basic tarot knowledge/resources via the internet or a phone app, you should be able to utilize this tarot spread fairly easily! I will also be addressing reversed cards in this post. I personally have stopped using reversals in my own tarot practice, but I thought I would include it in this post to give you some ideas about how to work with a reversed card! Also, I will using images and key words taken from the Galaxy Tarot App. If you don’t own a tarot deck, Galaxy Tarot is a great app to have on your phone! For the sample reading, I will allow you to take a peek at my fantastical and absurdist world: Wafer City. It’s literally a collection of cities situated on top of gargantuan floating bakeries such as wafer cookies, chocolate chip cookies and crackers. In the story, the world faces impending doom of the Hungry Children, who are the legendary child-like monsters who will come to consume all the floating cookie plates and destroy the world–as foretold by the prophecies. 1. If your world had a spirit or soul, what would be its defining trait? This is an exciting spread position in which you get to explore the archetypal energies that define your story world. Is it authoritarian and patriarchal (Emperor)? Is it illusory, mystical and allegorical (The Moon)? For this question, you can pull out tarot’s major arcana cards to connect with the bigger archetypes only. You can also look into tarot reversals so you can explore if your world embodies the balanced archetype (e.g. Emperor = order, leadership, unapologetic action) or showcases traits of the perverse/distorted archetype (e.g. Reversed Emperor = totalitarian, oppression, despotism). Focus Questions: When you look at the key words but cannot immediately associate them to your story, engage with the image instead. What is happening on the card? What is the first thing that captures your attention? How does the symbolic imagery translate onto your story world? Sample Interpretation: This is a funny card–since the story world is literally “hanged” in the air–a floating city! It’s also kind of wacky, and requires you to see things from a different perspective–often an upside down perspective. The spirit of this world is the dramatization of trivial things. For example, the doomsday and what threatens the very existence of this world is ginormous children coming to eat the floating cookies. It’s also a world that doesn’t really follow the conventional rules of “reality” and requires a willing suspension of disbelief. On a more meta note, you probably need to share my sense of humour to be able to enjoy the story, so in a way it is a very isolated story world that has a very quirky and potentially alienating perspective. 2. How does your world’s “spirit” manifest itself? In other words, how are the core traits of your story world expressed? Is it through a particular relationship between the characters? The way the plot unfolds? Lots of great things to discover here! Focus Questions: If your card is reversed, don’t just rely on the key words. You can get a lot more out of a reversed card if you are flexible! Try looking at the definition for the card in its upright position. For example, if 5 of Wands appears reversed, one of the key words is brainstorming. Now consider what happens when you brainstorm too much (lack of focus, disruption, mental exhaustion and lack of action)? What happens when you don’t brainstorm enough (stunted potential, laziness, rashness etc)? Consider what happens if the balanced archetype falls out of balance, either into overflow or lack. Sample Interpretation: 5 of Wands is about the conflict of desires, since the spirit of the wands is all about intentions and drive. Wafer City’s absurdist and wacky spirit becomes manifested mostly in the conflicts that the characters have with each other. They each have their own perspectives and agendas when it comes to confronting the “imminent apocalypse”. Some of them don’t care, and some of them care immensely. As they struggle against each other for the “best course of action”, the nonsense humour of Wafer City seeps through. 3. How does your world interact and affect your character? How are your characters affected and confronted by the core traits or values of your world? What is the relationship between your story world and your characters? Focus Questions: Ah–got another upright card again. But here’s another tip for reading reversed cards! If you card is reversed, consider if there is a discrepancy between what the card stands for when it’s upright, and the intentions/desires of your character or story. For example, if 8 of Pentacles were reversed, are you trying to express the upright 8 of Pentacles but maybe you are falling short just a bit? Or maybe it’s something you feel like you ought to do for your story world but haven’t gotten around to it, or haven’t figured out a way to do it just the way you want it? Sample Interpretation: The key theme here is probably repetition. The absurd events that happen to the characters repeat themselves in different but nonsensical ways, and in a way becomes a predictable reality pattern. The characters simply have to work through the absurdities one by one in order to achieve their goals. 4. The light & dark aspects of your world. Light and dark aspects are often two sides of the same coin, so that is why it is represented by only one card. However, you can always draw two cards to represent each aspect if you want to explore further! Focus Questions: Which “aspect” is your story more in touch with? Is it more “light”? Or is it more “dark”? Which aspects do your characters inhabit? Where do your characters fall on the “spectrum”? In what ways do the light and dark aspects manifest and express themselves? Sample Interpretation: The Chariot is a fitting card! Wafer City is basically a quest narrative, although it doesn’t seem to follow the rules of a typical quest that outlines the rules, consequences and supposed rewards of completing a mission. The light aspect of this world is that it is threatened by an imminent apocalypse, and the inhabitants of the world have a clear goal. The dark aspect is that this quest to save the world isn’t going to be so straightforward–such is the nature of Wafer City. To go “forward”, one must go around, backward, and upside down. 5. Food for thought. Use this space to summarize your thoughts or discover new ideas that have been lurking in your subconscious. This could also point to new insights and perspectives that you can explore. Focus Questions: Does this card affirm what you have already learned from the previous cards? Does it highlight or punctuate the messages so far in any way? If so, how? Is this card a reflection of aspects of your story world, or of you as a writer? What does it tell you? Sample Interpretation: King of Cups is a court card and represents someone with profound emotional depth. Going off of this idea, this card is telling me that despite the absurdist flavour and nonsense humour, what will be a core part of the story has to be driven by something deeply human. Otherwise, why read a story if it’s just a bunch of random funny things happening? It could definitely be entertaining, but in order for me to take the story to the next level, I have to think about how I can still make the characters partake in emotionally complex narratives while having some fun with bending the rules of reality. I hope this post has helped you with your world building process or has deepened your connection with your story world! Also, if there is a topic or area of writing that you would like me to explore with tarot, please comment below! I will see if I can whip up something.